At the age of fifteen, Busser Howell lost 98 percent of his vision. At the age of forty he lost the remaining 2 percent. Were the story to end there you would likely not be entirely shocked as this type of circumstance is not that uncommon. But this is not the whole storynot by a long shot. You see, Howell is an artista painter, to be exact. And prior to being a professional, working artist in Ne… w York City he was a partner and worked twenty-four years in an interior design and restoration business. Possibly even more amazing than his breaking of our stereotypes of the blind is the fact that he is not alone. Interviewing other blind artists to discover each person's particular point of view and what kind of descriptions work for them, author and blind artist Busser Howell's debut is an extraordinary look into a world never before seen or understood from the point of view of the visually challenged. Beginning by examining the concepts of creativity, perception, touch, and accessibility, Howell engages the vibrant, boundless minds of fifteen visually impaired artists to mine their thoughts, feelings, and understanding to piece together a common thread of experience. It is the artists telling their story, their preferences and dislikes, and their ability, despite their blindness, to tap into sight's brain-based function to see and comprehend our world and its contents. An enlightening and fascinating journey into the artistic process as seen by those whose vision is either severely impaired or altogether absent, Howell's impressive collection of writings and interviews is a probing examination of the artistic process and the nature of art itself. 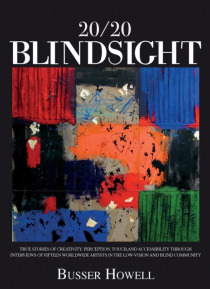 Evocative and inspiring, Blindsight is a deeply moving passage that documents the journey of visual artists as they transition from the visual input of the outside world to the output of their inner vision transcending blindness into the light of creativity.